Alvvays (pronounced "Always") is a Canadian indie pop band formed in 2011, originating from Charlottetown, Prince Edward Island, and currently based in Toronto, Ontario. It consists of Molly Rankin (vocals and guitar), Kerri MacLellan (keyboards), Alec O'Hanley (guitars), Brian Murphy (bass) and Sheridan Riley (drums). Their self-titled debut album, released in 2014, topped the US college charts. Their second studio album, Antisocialites, was released on September 8, 2017 and would go on to win the Juno Award for Alternative Album of the Year. Both albums have been short listed for the Polaris Music Prize. Alvvays was formed in Toronto. Molly Rankin, the group's singer-songwriter, is the daughter of John Morris Rankin, a fiddler with the Celtic folk family collective the Rankin Family, who enjoyed international success in the 1990s. Rankin grew up in Judique, Nova Scotia writing music with her neighbour, keyboardist Kerri MacLellan. She later met guitarist and partner Alec O'Hanley at a concert in her teen years. With the help of O'Hanley, Rankin quietly released a solo extended play titled She in 2010. Alvvays was formed the following year, with Rankin assembling MacLellan, O'Hanley, drummer Phil MacIsaac and bassist Brian Murphy to join the group. As the band grew up on neighbouring islands—Rankin and MacLellan on Cape Breton and O'Hanley, MacIsaac, and Murphy hailing from Prince Edward Island—Rankin was led to dub the band "merging of obscure islands in the east coast." She picked the name Alvvays because she liked that it had a "shred of sentiment and nostalgia." The spelling of the band name was due to the fact that there was already a band named Always signed to Sony. They often made the long drives from Cape Breton and Prince Edward Island to Toronto, where they all eventually moved and secured jobs that allowed them to tour occasionally. The group toured extensively as supporting acts for bands such as Peter Bjorn and John and The Decemberists. Their debut album was recorded in Calgary with Chad VanGaalen in March 2013; Graham Walsh helped track the album while John Agnello helped mix it. After the album was complete, the group made cassette copies for festival bookers and fans at concerts to pass around. 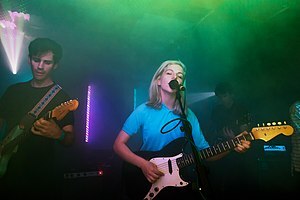 Alvvays were signed to Polyvinyl Records on the strength of their SXSW performances and online response to the demo of their single "Adult Diversion". The album Alvvays was released by Royal Mountain Records (Canada), Polyvinyl Records (US), and Transgressive Records (Europe) in July 2014. Simon Vozick-Levinson, writing in Rolling Stone, called the eponymous album an "indie-pop wonder". Alvvays went to #1 on US college charts on August 5, 2014; in November that year they performed in Los Angeles with another Canadian band, Absolutely Free. "Archie, Marry Me" became a minor hit. The single for "Archie, Marry Me" featured the b-side "Underneath Us" which was recorded sometime after the eponymous album. The group toured heavily in support of their debut, including slots at Glastonbury 2015 and Coachella Valley Music and Arts Festival in 2016. In addition to album material, Alvvays often performs cover songs of artists such as Kirsty MacColl ("He's On The Beach"), Camera Obscura ("Lloyd, I'm Ready to be Heartbroken"), The Hummingbirds ("Alimony"), and Deerhunter ("Nosebleed") among others. The debut album was nominated to the shortlist of the 2015 Polaris Music Prize. They performed at that year's gala with the Toronto Symphony Orchestra. Alvvays has been sporadically recording and writing their second studio album, since 2015. Several new original songs had been performed throughout 2014 and 2015, titled "Your Type" (often the opening song of the show), "New Haircut" (later re-titled "Saved By A Waif"), "Hey" and 2016 saw the addition of "Not My Baby", and "Dreams" to the new material often performed. Following the addition of other songs such as "Plimsoll Punks" as part of live shows in spring 2017, Alvvays released a teaser clip of a song called "In Undertow" from their second album Antisocialites. As well as songs already played at previous shows, new song titles from this record include "Already Gone", "Forget About Life", "In Undertow", "Lollipop (Ode to Jim)" and "Saved by a Waif". The album was released on September 8, 2017. A North American and European tour in support of the album was announced for autumn 2017 and drummer Sheridan Riley joined the band for this tour. A second UK tour in Spring 2018 was announced in September 2017. On September 16, 2017 at a show in Antwerp, a male audience member jumped on stage and attempted to kiss singer Molly Rankin. Ken Veerman, the director at Trix, the show’s venue in Antwerp, apologized on Facebook. In 2018 they received a SOCAN Songwriting Prize nomination for their song "Dreams Tonite", and Antisocialites was shortlisted for the 2018 Polaris Music Prize, and won a Juno Award for Alternative Album of the Year. Alvvays' music has been described as jangle pop by the music press and its members. According to Rankin, the band's emphasis is primarily on strong melodies, rather than for a specific genre: "If old people ask, I say it sounds like the Cranberries. If young people ask, I call it jangle pop. If a punk asks, I say it's pop." The band sounds similar to Best Coast and has often been compared to Camera Obscura; Rankin noted she shared vocalist Tracyanne Campbell's "fondness for the pathetic perspective." Rankin sought inspiration from Stephin Merritt, frontman of the Magnetic Fields, appreciating the honest but lighthearted nature of his lyrics. Rankin's personal influences include The Magnetic Fields, Teenage Fanclub, Dolly Mixture, the Smiths, Celine Dion, Pavement, the Primitives, and Oasis. While the band does not have an overt Celtic music sound, Rankin acknowledges that she was immersed in the genre from childhood, and it has a discernible influence on the way she sings and writes melodies. ^ "The NACC Charts for October 24". October 24, 2017. ^ "Alvvays’s Molly Rankin broke with family tradition". The Georgia Straight, November 26, 2014. ^ a b Brad Wheeler (July 29, 2014). "Alvvays: 'Nobody talks about the adventurous kind of love'". The Globe and Mail. Retrieved October 22, 2015. ^ a b c Hannah Ghorashi (November 23, 2013). "Discovery: Alvvays". Interview. Retrieved October 22, 2015. ^ a b c Scott Kerr. "Alvvays: Biography & History". Allmusic. Retrieved October 22, 2015. ^ a b c d Rebecca Schiller (November 21, 2014). "Alvvays Singer Molly Rankin on Starting a New Band, Chad VanGaalen's 'Weird' Studio". Diffuser.fm. Retrieved October 22, 2015. ^ a b c d Ilana Kaplan (March 11, 2015). "SXSW Lone Stars: Alvvays on Archie's Identity and Scot-Pop". Spin. Retrieved October 22, 2015. ^ Philip Cosores (July 22, 2014). "Alvvays: The Best of What's Next". Paste. Retrieved October 22, 2015. ^ Alvvays: "Archie, Marry Me". Stereogum. ^ Vozick-Levinson, Simon (July 14, 2014). "Alvvays 'Alvvays' Album Review". Rolling Stone. Retrieved July 25, 2014. ^ "CMJ Charts: August 5, 2014". CMJ. Archived from the original on August 14, 2014. Retrieved August 24, 2014. ^ Skeleton Tiger (November 9, 2014). "ALVVAYS - UNDERNEATH US". YouTube. Retrieved October 10, 2017. ^ a b Adrian Spinelli (September 21, 2015). "Catching Up with Alvvays". Paste. Retrieved October 22, 2015. ^ "Search for setlists: Alvvays". Setlist.fm. Retrieved October 10, 2017. ^ "We need to talk about these new Alvvays songs". DIY. Retrieved October 10, 2017. ^ "New tweet from Alvvays. Last time they tweeted was November... • r/alvvays". reddit. Retrieved October 10, 2017. ^ "An Interview with Sheridan Riley". Movement Drum Company. Retrieved August 16, 2018. ^ "Polaris Music Prize Reveals 2018 Short List". Exclaim!, July 17, 2018. ^ "Toronto's Alvvays welcome you to the jangle on their debut album". Aux, August 5, 2014. ^ "Alvvays – Chart History: Canadian Albums". Billboard. Retrieved June 14, 2018. Antisocialites: "2017-09-15 Top 100 Scottish Albums Archive". Official Charts Company. officialcharts.com/. ^ "The Official UK Top 40 Albums Chart". Radio 1. Retrieved October 10, 2017. ^ "Alvvays – Chart History". Billboard.com. ^ "Alvvays Chart History Canada Rock". billboard.com. Retrieved December 6, 2018. ^ "Alvvays-- Lollapalooza Interview, 2017". Soundcloud.com. Retrieved October 10, 2017. Wikimedia Commons has media related to Alvvays. This page was last edited on 7 April 2019, at 15:21 (UTC).